Created by John Ozbay, Conversus Vitra is a proportional-integral-derivative (PID) loop controlled continuous pitch hydrocrystalophone. It consists of four wine glasses, four motors to spin the glasses, four servos touching the glasses for friction, a MIDI keyboard, and four DC pumps to control the water level in the glasses. Conversus Vitra uses a proportional-integral-derivative (PID) controller to control the pitch of the wine glasses. As the player touches the MIDI keys, the pitches that are produced change by pumping or sucking water from individual glasses. • Player must tune the glasses or bowls first. • Player must touch the glasses or bowls. • Glasses or bowls cannot be tuned dynamically on the fly. With Conversus Vitra, the glasses constantly spin. When the player touches the MIDI keyboard, notes are translated into water levels using a PID loop by listening to the glasses, and water is pumped into or sucked out of the glasses as the user plays. 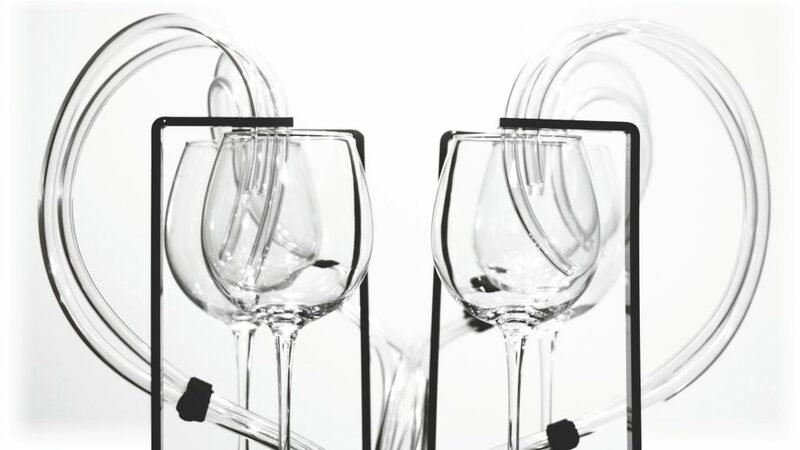 With this approach, the player doesn’t have to carry more than four glasses, and is not limited to set tunings of these glasses. Because the glasses can be tuned on the fly, new playing methods can be learned and applied. In addition to its portability, it makes playing wine glasses easier for everyone by reducing the time it takes to learn how to play. Being able to use MIDI as an input adds a few new properties to wine glass playing. For example, it allows the player to record a MIDI file of what’s being played, and have an exact replay of it, or the player can quantize the MIDI files and modify them digitally, without digital artifacts to the sound, as the sounds themselves are created physically. A complete project report is linked here. Conversus Vitra was supported by a grant from the Frank-Ratchye Fund for Art @ the Frontier (FRFAF)— an endowment founded to encourage the creation of innovative artworks by the faculty, students and staff of Carnegie Mellon University. With this fund, the STUDIO seeks to develop a cache of groundbreaking projects created at CMU — works that can be described as “thinking at the edges” of the intersection of disciplines. John Ozbay is a graduate student in the School of Music at CMU.